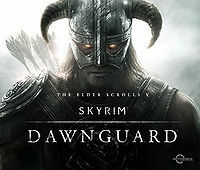 Dawnguard is the first major official add-on for Skyrim. The add-on revolves around the Dawnguard, an ancient organization dedicated to hunting vampires and thwarting the schemes of Lord Harkon, who intends to use an Elder Scroll to permanently blot out the sun. You can choose to aid the Dawnguard in their quest to destroy the vampires, or join the vampire clan and gain the powers of a Vampire Lord. Creatures — Of the creatures added by the add-on, most are new variants of creatures already present in the original version of the game. A few creatures added are entirely new types, and there are several unique creatures added as well. Items — New items added by the add-on include apparel, armor, books, jewelry, weapons, and more. Magic — Three new blessings, four new dragon shouts (only three of which are player-accessible), and nine new spells are added by the add-on. In addition, new features have been added to Lycanthropy and general Vampirism, while the Vampire Lord form is entirely new. NPCs — Over 80 new NPCs have been added by the add-on, many of which are aligned with one of the two new major factions. Some can be found at their main location immediately after installing the add-on, while others can only be encountered during certain quests. Places — 24 new places have been added by the add-on, though none appear on the map immediately. Some places may not be entered until the related quests have been started, and many quests will send the player to places that already existed in the original version of the game. Quests — 39 quests have been added by the add-on, with both a main questline and multiple side quests. There is no quest immediately added to the quest journal when you first install the add-on. The Dawnguard — A group of vampire hunters dedicated to destroying the Volkihar vampire clan. All players who complete the first quest in the add-on's main questline must help this faction initially. Membership in this faction allows you to freely enter and use all areas within Fort Dawnguard. Volkihar Vampire Clan — The Volkihar vampire clan, led by Lord Harkon, intends to blot out the sun and dominate Skyrim. Players may choose to join this faction during the add-on's main questline, or destroy the faction altogether. Membership in this faction allows you to freely enter and use all areas within Volkihar Keep. Ten new achievements can be earned after installing the Dawnguard add-on. Eighteen new loading screens were added by the add-on. Several new world interactions are added by the add-on which do not have their own individual article pages. 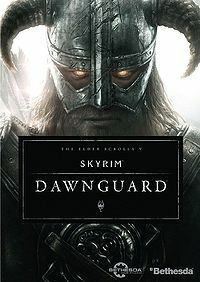 Dawnguard was subject to a 30 day exclusivity deal with Microsoft, where it was only available on the Xbox 360 (from June 26 2012). As it turned out, it was released for the PC after 36 days, and due to severe performance issues, it was February 2013 before it was released for the PS3. The alchemy lab in Breezehome may become unpurchasable, or may not appear after it has been purchased. This bug is fixed by version 1.0 of the Unofficial Dawnguard Patch. Hearthfire inadvertently fixes this by resetting the steward's dialogue to include the children's room. This may be fixed via the console by entering "e4ef9".disable followed by "e4ec8".enable . NPC and player hair may glitch, change color, or even disappear. Restarting the console seems to fix this. ? Dragon souls may not unlock new shouts, even if the player has more than one dragon soul. ?